CHARLOTTESVILLE, Va. (CBS19 NEWS) -- A retired FBI agent has joined three other current and former law enforcement officials in calling for the pardon of former University of Virginia student Jens Soering, who is serving life in prison for the 1985 murders of his then-girlfriend's parents. At a press conference on Monday, that former agent, Stanley Lapekas, said he had discovered proof that one of his FBI colleagues created a psychological profile of the suspect in the 1985 slayings of Derek and Nancy Haysom in Bedford County. "There's absolutely no doubt about it that Ed Sulzbach did a profile," said Lapekas, citing an FBI memo he acquired through a FOIA request made as he reviewed the case file. "It specifically states that FBI Quantico has conducted a psychological profile and determined that the person or persons responsible were close to the family." Albemarle County Sheriff Chip Harding, who has been working on the case for Soering's pardon for years, said Soering only met the Haysoms once, for about 30 minutes. The Haysoms were found brutally stabbed to death in their Bedford County home. Their daughter, Elizabeth Haysom, and her then-boyfriend, Soering, fled to Europe and were subsequently captured and tried in the case. Soering initially confessed, but recanted and has maintained ever since that it was a false confession made to protect Elizabeth, who was also found guilty in the case. The discovery of the FBI memo is significant, Lapekas said, because a longtime Bedford County Sheriff's Office investigator has insisted no such profile exists. Lapekas also discovered news accounts that mention the FBI profile, which never made it into court. "The detective who worked the case in Bedford County continued to maintain that that had not happened," Lapekas said. That detective, Major Ricky Gardner, still works for the Bedford County Sheriff's Office and has publicly maintained his belief in Soering's guilt. Gardner did not respond to a request for comment on the case. The discovery of the FBI profile is the latest in a string of announcements made over the past few years by Soering's longtime attorney, Steve Rosenfield, and the law enforcement officers who support Soering, including Harding, Lapekas, former Charlottesville Police Sergeant Richard Hudson and former Bedford County Sheriff's Office Senior Investigator Chuck Reid. Among the evidence discovered is the presence at the crime scene of DNA from two unknown men. No physical evidence ties Soering to the scene. Additionally, Lapekas and the other law enforcement officers are troubled by the use of a bloody sock print at Soering's trial to tie him to the scene. 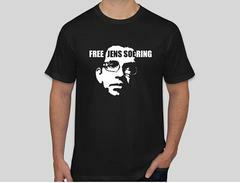 Forensic experts have said the print was too small to belong to Soering. Soering's pardon appeal is under review by Governor Ralph Northam's administration after Governor Terry McAuliffe made no decision on the petition before he left office. The four law enforcement officers supporting Soering's petition have written a new letter urging Northam to act quickly on the petition for pardon. 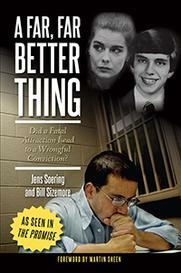 "Each of us has concluded that it is not likely Jens Soering was present when the murders were committed," they wrote. Harding says it's unfortunate Gardner and other Bedford County officials aren't willing to support reopening the case in light of the new evidence. "If we all had that attitude, no one would ever get exonerated,' he said.